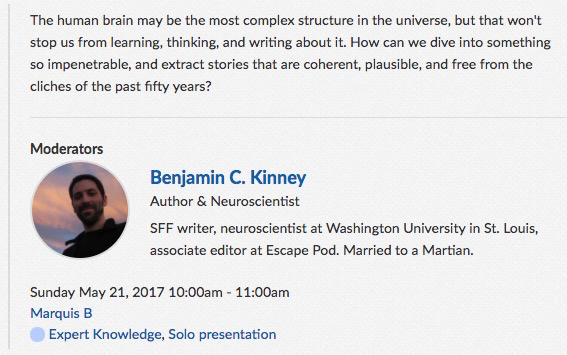 I’m thrilled to announce that I’m going to have a speaking slot at the SFWA Nebula Conference in June! My talk “Understanding Neuroscience: The Evolved Brain” will take place on Sunday at 10am for anyone with enough fortitude to shake off their hangover and come here me talk about neuroscience, and how we can improve our understanding and portrayal of the human brain in fiction. I haven’t yet developed the talk, so if you have any questions or issues too complex for #NeuroThursday, let me know! Or ask me over a beer1 afterward. I hope to see some of you there! I’ll only be at the Nebula conference Sat-Sun (arriving late Friday night) due to the travails of work, but so it goes. This entry was posted in Appearances, Science on March 29, 2017 by bckinney.